However, our current version of the SQLite implementation does not support foreign key constraints. Consider this association, for more on associations, see this section (link). 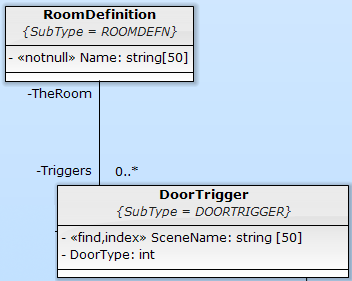 In this association the relationship between RoomDefinition and DoorTrigger implies that a DoorTrigger cannot be persisted in the database without a RoomDefinition defined. This referential integrity is not supported. You could delete RoomDefinition and have several Door Triggers left behind that are orphans. You need to handle this yourself. It's easy, however. We can scan through all the Triggers associated with myDefinition, mark all the times for deletion, then use the Repository.Commit() method to do a Unit of Work save.